I must be nuts. Who in their right mind would say "yes" to an offer to leave frigid, snow covered, miserable Philadelphia on March 1st and go to someplace that is even colder and snowier? The answer is me and a few other crazy birders. The nice part of this adventure is that our birding friend Brandon has a lake house up there and was generous enough to ask a few of us to come up. He promised some good birding and a chance to see some species that you can usually only find in Boreal forests of Canada. I drove up with Alyssa and Sam on Friday afternoon - taking work calls in the backseat of Alyssa's Honda and doing email from my phone. It worked out pretty well. We arrived at the Lake House just in time for a new experience - snowmobiling. Here is the gang getting ready to drive across the frozen lake to the restaurant. Brandon's house is in the background. 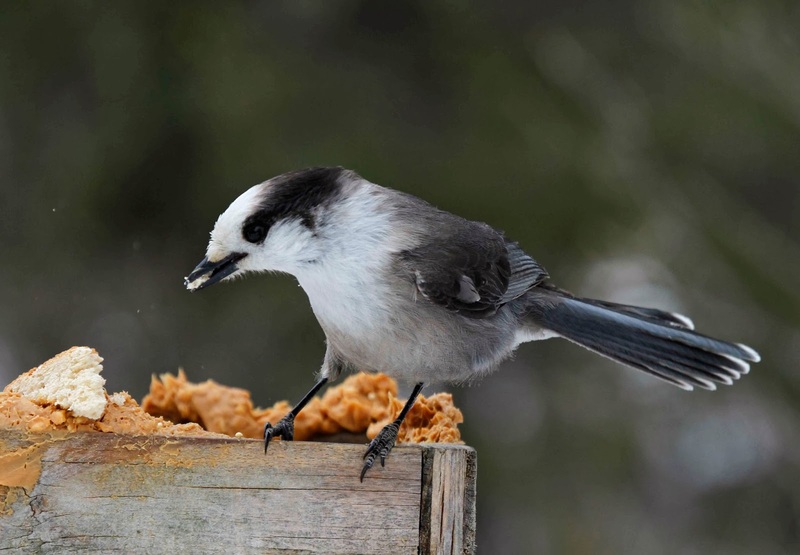 Saturday, we headed out to Bloomingdale Bog in search of boreal species such as Gray Jay, Boreal Chickadee and Black-backed Woodpecker. We geared up for a cold hike and headed out onto a snowmobile trail through the woods. 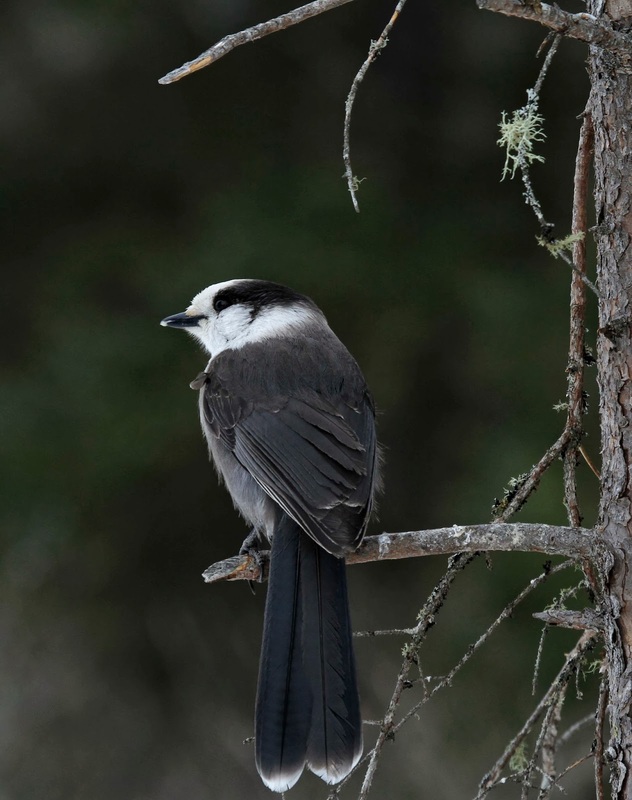 After a short hike, a Gray Jay showed up right next to us with a friendly look in his eye. He was soon joined by friends and they all followed us up the path. Aw, that's nice. We soon found out why they were so interested in us - they want to be fed. Someone has a bird feeder in the middle of the woods and everyone knows that the Jays will eat bread and peanut butter if you bring some along. I guess they are used to it. Alyssa shot this video. The birds are just wary enough but eventually take the bread (or in this case, Sam's Club Mini Cinnamon Rolls) right out of your hand. Watch the very end. 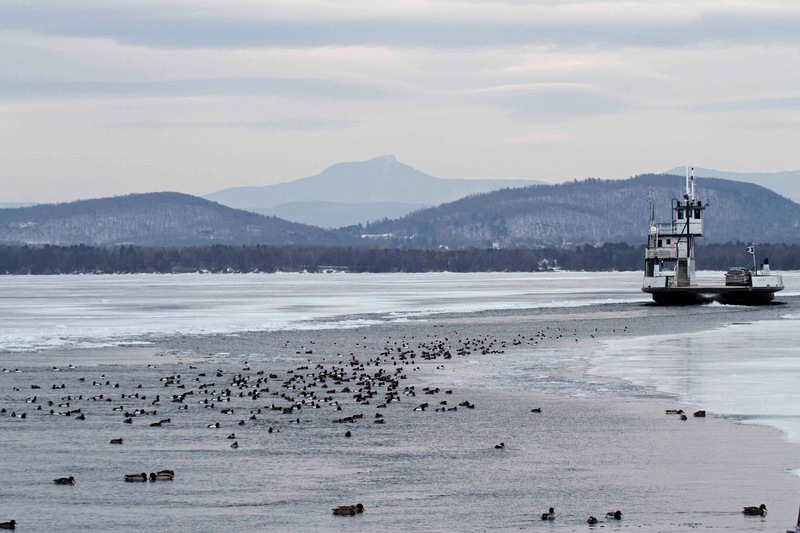 We busted on the other boreal species on Saturday so headed off to Lake Champlain to see some ducks. We were surprised that the ferry was still running with all of the ice but as you can see, the ferry keeps a path open. The open water attracts all kinds of ducks including some rarities. There was one Tufted Duck mixed in here but it never came close enough for a photo. 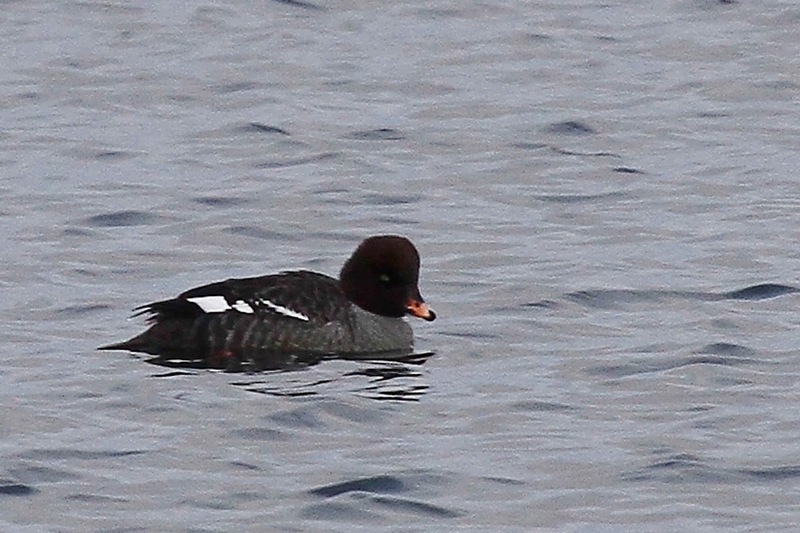 The other rarity was a Barrow's Goldeneye. This duck was close to the ferry terminal so I was able to get a few photos. Here she is preening her belly which is always cute to watch. 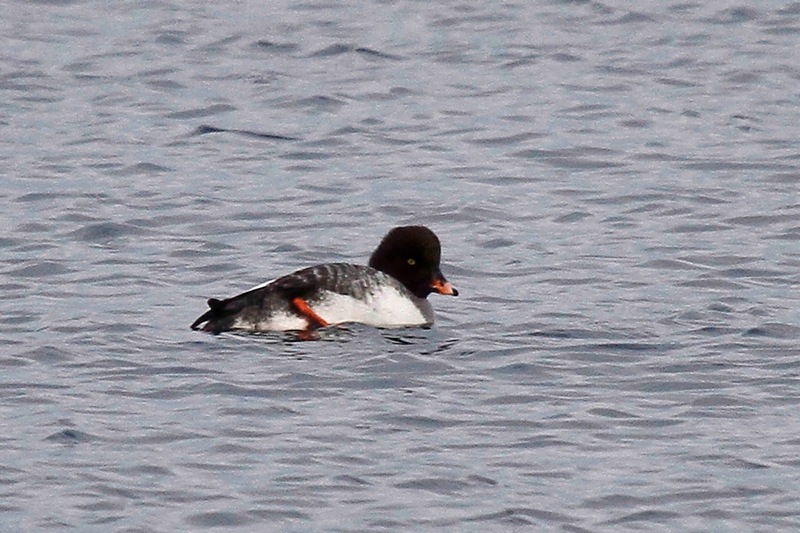 We have Common Goldeneyes in the east. Barrow's are usually found out west which is what makes this a rare find. I have seen Barrow's Goldeneyes in Seattle way back in 2006. 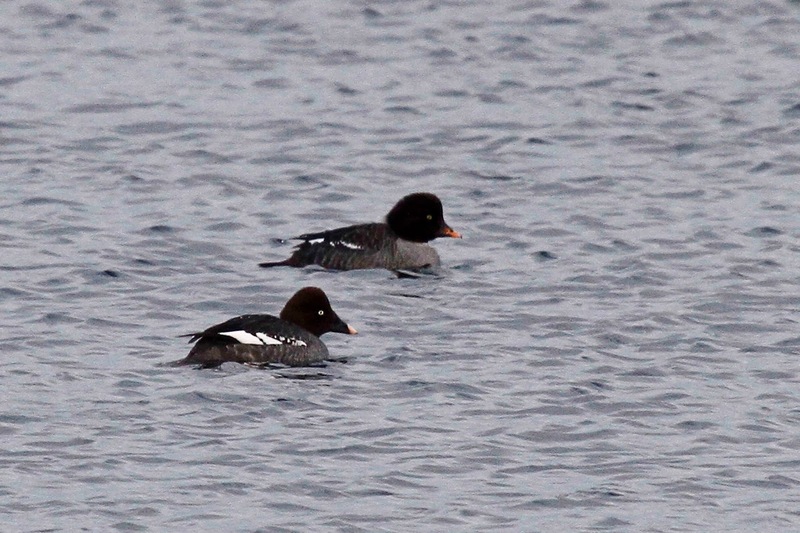 The difference between Common Goldeneye and Barrow's can be seen on the shape of the head and color of the bill. Here is a photo of both birds swimming side by side. Notice in this photo, the bird in front has a black bill with yellow tip while the bird in the back has the opposite - yellowish bill with black tip. Here are a few more duck photos from the day. 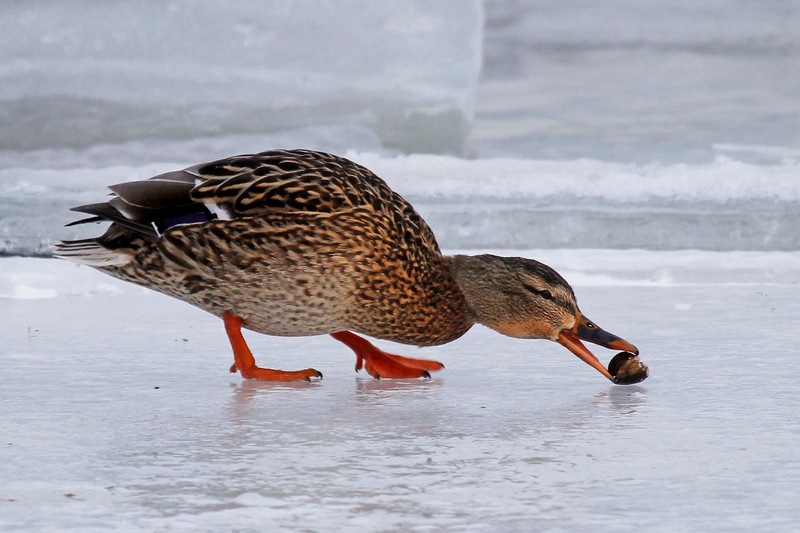 We had a good laugh at the ducks who decided to try to walk on the ice. 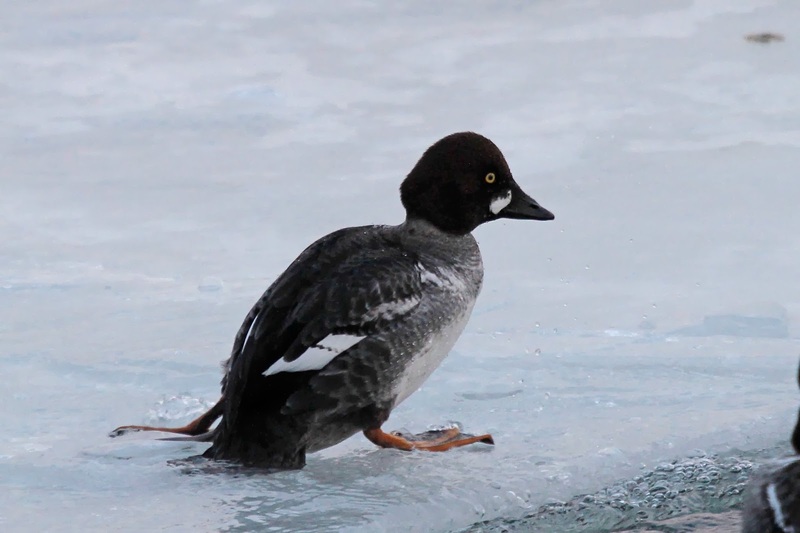 Here is an immature male Common Goldeneye trying his luck without skates. 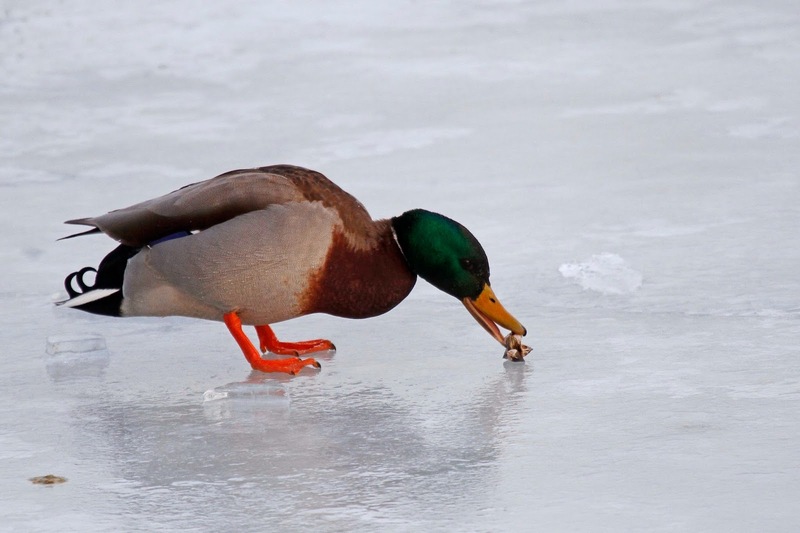 These 2 Mallards chased mussels around the ice trying to get them open. It entertained us for a while. 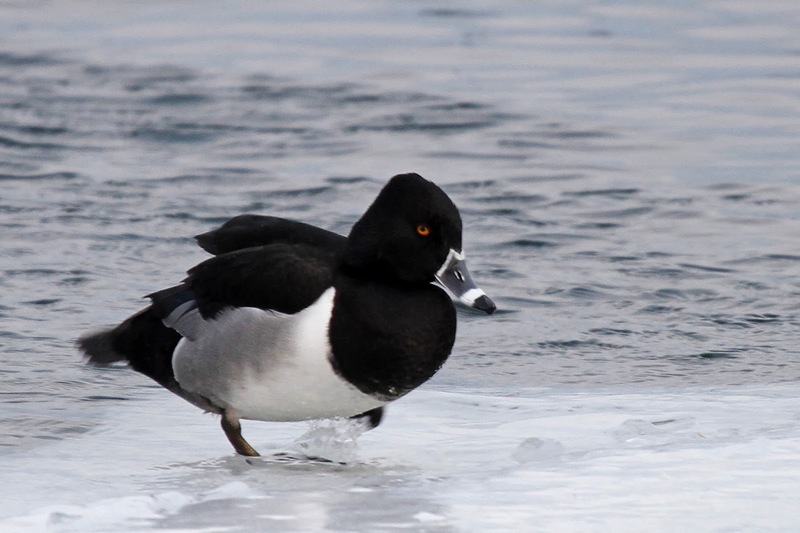 This is a Ring-necked Duck who insisted on sitting out on the ice but couldn't quite get comfortable. Each time the ferry would come in, all of the ducks would fly to get out of the way. 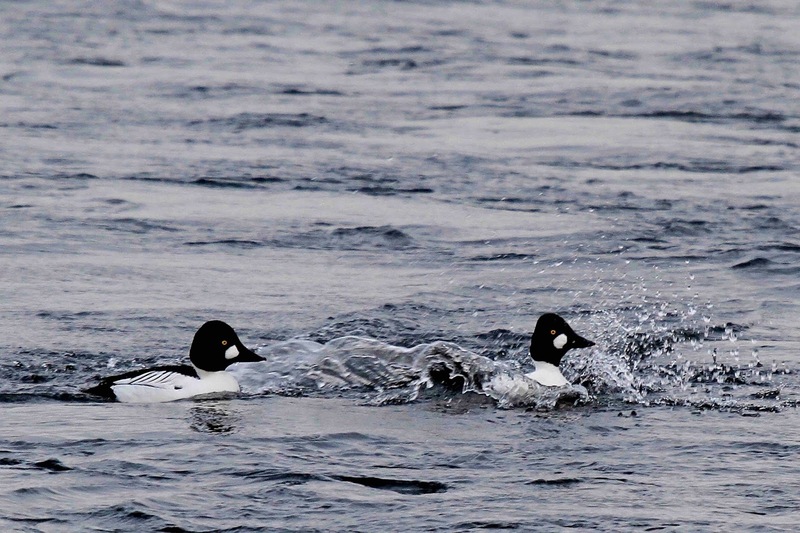 Here are a few male Common Goldeneyes coming in for a landing. The photos aren't the best due to overcast conditions but you can see how many ducks there were. More to come later - including another video which was a highlight of the trip. 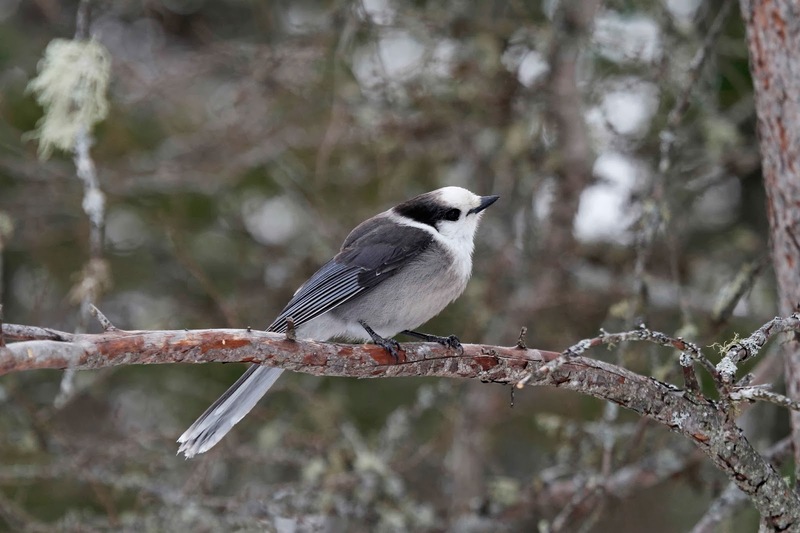 Love the video and I could grow fond of the Gray Jay. It really is a pretty bird and it matches my bathroom! Visit addison vt for lots of snowy owls.Its just across the bridge near fort ticonderoga. They are everywhere and easy to find. Adirondacks Part 2 - Lifer!